Father´s Day is celebrated in Spain on the 19th of March and to mark this day i decided to bake some cookies which i knew my father would just love! These are healthy cookies using oats and are vegetarian. They turned out chewy and delicious. So…lets do some baking together today? Cream the butter till fluffy and then add the sugar and cream it some more till its more fluffy. Add the salt, vanilla and then the oats which i powdered half and left half as it is. Add the flour, baking soda, sesame seeds and mix. The mixture will now resemble a dough. Keep it for half an hour covered with a cloth. Line a baking tray with butter(oven proof paper) and make small balls of the dough. Put them in the tray leaving a lot of space between each ball as they tend to increase in size. Bake for about 15 minutes till slightly browned. Cool and keep in an airtight container. To add some chopped chocolate to these cookies, bake them till set and then press a few pieces of chocolate on to them and bake till done. This recipe makes about 24 cookies, you can halve the recipe if trying this for the first time. You can flavour them with any other essence of your choice. You can replace sesame seeds with any powdered nuts of your choice. Cnnamon is also a nice essence for these cookies, you can use cinnamon powder. 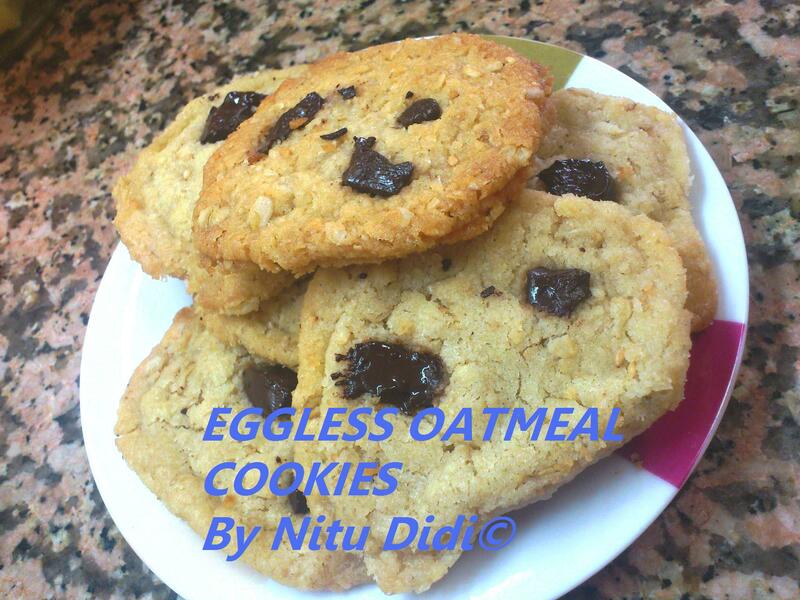 This entry was posted in Eggless Sweet Temptations, Everything Vegetarian, Fusion, Healthy Options, Low Cost, Magic Bullet and tagged cookies, eggless, healthy, oats. Bookmark the permalink.